I have been interested in Astronomy for a long time (as long as I can remember, really). For Christmas 2001 I was given a Celestron NexStar 4 telescope (shown to the right) and a wedge tripod. The telescope has a computer controller in a nice handheld package that also rests in an integrated niche in the mount arm. After it has been calibrated (aligned), you can select objects from lists in the controller and the telescope will point to them automatically. Once pointing at them, it will track the object taking into account the rotation of the Earth. Unfortunately, the original controller (which I have) has numerous faults (described here) and I'm trying to get a replacement. 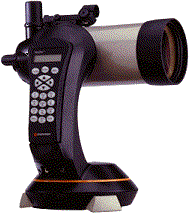 The faults are common to all NexStar 60/80/114/4 telescopes shipped before December 2001. I've also opened up my hand controller to see what's inside. What prompted the giving of the telescope is that my father and I will be going on a one month trip in 2002. At times we'll be many hundreds of kilometers from the nearest town - perfect for stargazing, as long as the skies are clear. I've set up a web page for any photos I take (however I take them). I've decided that my Casio is just not suited for long exposures, and therefore not worth the cost (and effort) to connect to the telescope. I've recently acquired a 35mm SLR, so I'll be looking into connecting that to the telescope. I use Astromist on my Treo 650, along with an Aircable Bluetooth serial adapter. I constructed a custom adapter that powers the Aircable from the telescope and allows everything to fit neatly inside the telescope mount behind the hand controller. Before that, I used Solun on my EPOC handheld computer. If you have a SIBO-series Psion handheld computer (eg. Series 3a or similar) you might be interested in my Astronomical Calculations page. NexStar Resource Site - Lots of info on the NexStar series of telescopes, including information on the computer control protocol. CKC Power Digital - Info on connecting digital camera to telescopes. ScopeTronix - Lots of bits and pieces for connecting digital cameras to telescopes. sci.astro.amateur - Usenet newsgroup for "amateur astronomy" related talk. Binocular, Telescope and Optical World - Local shop (in Perth, Western Australia) where my telescope was purchased. They do regular Thursday night viewings! Astrostack - Freeware image 'stacking' and processing. Astroart - Commercial software (free demo) for image 'stacking' and processing. NASA - JPL Solar System Simulator - A brilliant visualisation tool! Web based. Celestia - 3D Space Simulator. Not just the solar system, but the whole galaxy! 11MB(!) download. Astro Guiding - Astronomy Forums - Very new set of forums, looks like they cover just about everything! Last updated: 2005-12-20. Copyright © 1999-2019.